People hoping to win a pair of tickets to next month's Live 8 concert in London sent more than 1 million mobile phone text message entries in the opening hours of a text lottery Monday morning, organizers said. 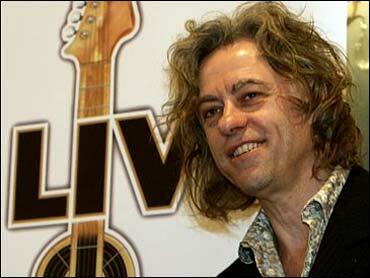 Tickets to the London installment of Live 8, the series of international concerts organized by Bob Geldof and aimed at promoting awareness of poverty in Africa before July's G8 summit, will be distributed through the text lottery. For a chance at one of the 66,500 pairs of tickets, individuals can text in the answer to a single question, which asks which of three cities — Berlin, Moscow or Edinburgh — are closest to the site of July's G8 summit. The deadline for applications is midnight on June 12, and participants must be British residents. Sophie O'Kelly, 23, said she entered the lottery once Monday morning. "The question was really easy," she said. "I might enter once more." While the concert tickets are free, entering the lottery is not. Each text submission costs $2.70. Event organizers will donate the first $2.9 million in proceeds to the Prince's Trust, which canceled its own, usually star-studded, annual concert in Hyde Park to make way for Live 8. Prince Charles established the trust in 1976 to raise funds for disadvantaged youth in Britain. With over a million entries already acknowledged, that amount seems likely to be raised by the end of the day Monday. All further proceeds will go toward recouping organizational costs for the concert. The text lottery is open to U.K. residents only, prompting some criticism about the exclusion of Ireland. Live 8 spokesman Bernard Doherty said the decision was motivated purely by logistics. "In the short time we had to distribute 150,000 tickets, the simplest, fairest and quickest way to distribute was by text lottery. With that in mind, it had to be with U.K. customers," Doherty said. "Bob apologizes to those people in Ireland, the land of his birth, but nothing can be done." Doherty added that the question for the lottery was changed after the original one was leaked to the media. Organizers had planned to ask where the 1985 U.K. Live Aid concert took place — London — rather than the location of this summer's G8 summit.